Thank you to those of you who have told me things to do to try to help my wrists and arms!! I tried resting my arms today from the computer, and for the most part, it worked. Lots of rubbing and advil, plus a couple of hours on the phone while I shopped & made dinner. But it’s so hard for me to not be plugged in. I read books on my computer, I check recipes, I look up news stories, etc. I’m sure you guys are the same. I’ve decided it’s not really typing that makes me hurt, because it all seems to be primarily in my right forearm and I figured out it is probably the constant holding of the mouse. Yuck. What a pain. Like, for real. :-p As the night has gone on, though, I find myself hurting more, so I really need a break tomorrow, which I plan on having by removing myself from my house and taking my mom to lunch. So anyway, it was Fat Tuesday today and I didn’t really celebrate. No parties or anything like that. 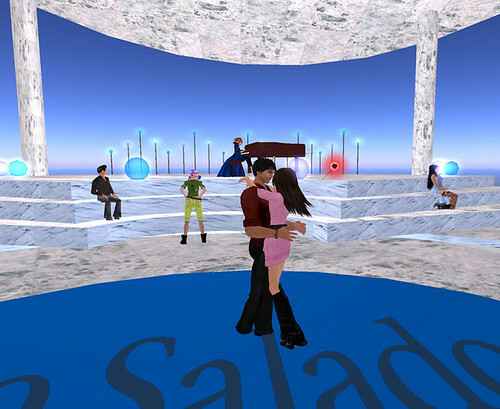 I wasn’t really in the mood for a party, but I heard there were some decent ones here and there in SL. I did, however, pull out last year’s beads and masks and ended up putting together a little party look for myself. I don’t know why I decided on that dress. Mardi Gras outfits are normally pretty…well, slutty. It just seemed more fun to wear a fluffy long dress instead of something that gave away the farm. I don’t know if that dress is available for purchase, it was a camping gift from Hal*Hina some months ago. It’s so pretty, though, and I don’t know why I don’t wear it more often. The kitten and I were running around the island and stopped over on Layne’s land for pictures. Layne has just developed this gorgeous paradise on her land. I’m so lucky to have her living on the island, because her piece of land is truly remarkable. Plus there’s a lot of places to sit and hang out! It’s definitely bedtime now, and I plan on doing some inventory cleaning tomorrow at some point. I don’t even know what to wear anymore. Ok, so I’ve been kind of a bad blogger lately. I’ve been lazy. Plus I joined Snapzilla because I wanted to comment on Brody’s pics and now I’ve been cluttering up my page with pictures. LOL I hate hate hate hate hate how low res they are there, though. HATE. But it’s still amusing to me right now, so I’m playing with it. This week I DJed an anniversary party for my friends Night & Margo. 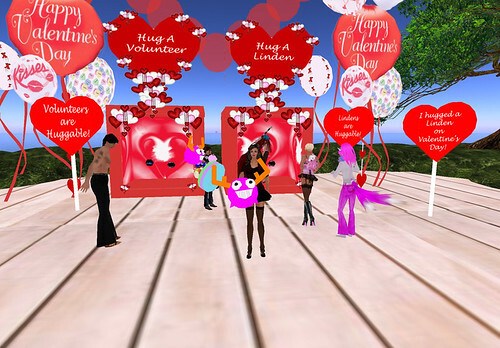 One year together in SL!! I met them both around the same time they were getting together, and they’ve always been just so kind to me, so it was wonderful to get to DJ for them. In between parties and doing an enormous amount of shopping, I’ve been trying to redecorate our home. My friends are AMAZING at decorating. I’m afraid that’s a skill I don’t have, in SL or RL. I just signed up for a subscription to Elle Decor, so maybe I’ll learn something when the magazines start rolling in. But until then, I just go to furniture stores, stare blankly at what’s there, and go buy shoes. If you guys have store recommendations, I’d love to hear them. I already know Mudhoney, The Loft, Instinct, Corn, and Mudshake. When I’m not doing all of that, I’ve been getting to spend more time with Brody lately. You all can’t imagine how happy that makes me. At the risk of sounding too incredibly mushy… when he’s with me, everything just seems so much better. But when he’s not with me, I need a friend. And while the girls are great and I adore them to bits, I can’t always depend on them to come hang out with me whenever I’m bored. So I went and got myself a new friend who will be there whenever I want her to be. Isn’t she PRECIOUS?! My beautiful new cream tabby, named Elle, for Elle Woods. I love Elle Woods! When she got Chutney to confess to killing her own father just by talking about perms…oh it was beautiful. So my kitten’s name is Elle. 🙂 And I love her. Just LOVE her. She bounces and meows and plays with toys bigger than she is and eats a lot of food and wears sweaters…it’s just CUTE. I even got together last night with Khari, Nikki, and Sehra and all their animals and we had a little party with our pets bouncing around. I feel another shopping binge coming on. I’m on my way to bed after a very busy, but very fun, night! I was hired to do a 1 hour set at the grand opening of the Casa Spa by Dorian over in the Costa Rica sims. Yes, a spa in SL. 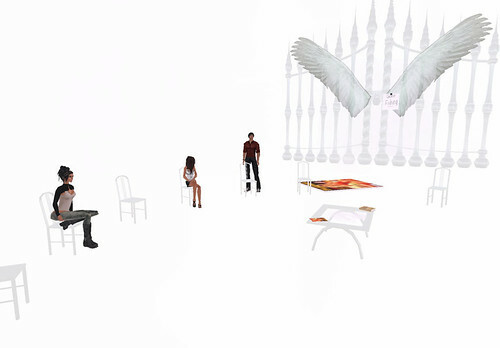 🙂 I’ve blogged about another one that’s in SL last year, but you know, I STILL haven’t booked an appointment to any of them! It was a fun little set, but the best part was that Brody got to come hang out with me. We simply don’t get enough time together in SL, so having him by my side while I did my thing was just awesome. Big thanks to Bibe, Mena, and the Casa Spa staff for having me out there. Now, since I had my stream up, and since everyone’s been wanting to have a hump day party…that’s exactly what we did! Lots of craziness, lots and lots of chatting, lots of dancing, and lots of fun! Even Laleeta got in on the action. Well…kind of. She was snoozing while we were partying, but she didn’t want to be left out of the fun! Sophia was an absolute angel and kind of took over as hostess, which I appreciated GREATLY because it’s often hard for me to do the DJ thing and host at the same time. I don’t know that she was hostessing as much as just talking, but either way, my hetero life partner took one for the team and ended up getting quoted on another blog. LOL!!! I won’t say which, you’ll just have to look around for it. After the game, I spent some time chatting with my girls about the party. That’s always the most fun for me, when I can change out of my party clothes and we can talk about who was there and who wore what and who said what. Have I ever mentioned how much I adore my girls? I’m blessed beyond reason to have found them, and I say that in all honesty. I’m finally heading to bed, exhausted but happy. Spending hours with Brody and my friends? It makes this blogger one happy happy lady. 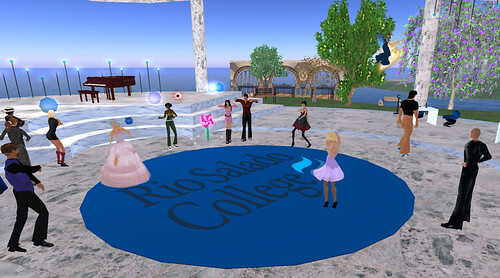 I had the chance yesterday to DJ for a bit for the opening of the virtual campus of the Rio Salado College. It was totally a lot of fun! It was really great to meet some of the people who are joining us in SL through their school. They were exceptionally nice people and I really enjoyed myself. 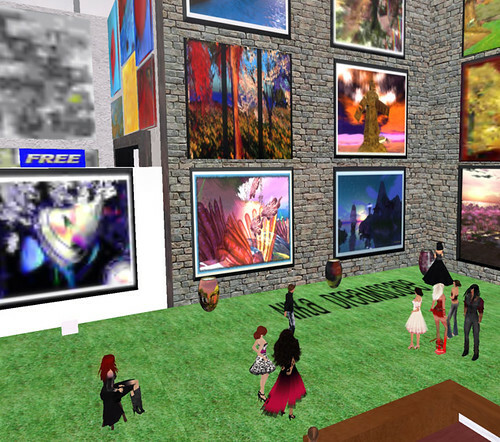 I was the opening act for SL live performer Cylindrian Rutabega. 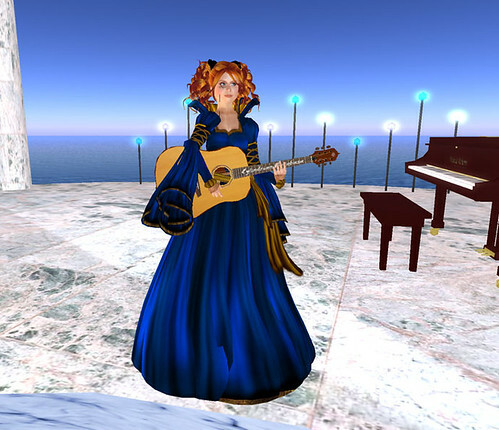 I’d never had the chance to hear her before [I don’t get out to a lot of live shows in SL, I’m sorry to say], but it was awesome! Her voice is amazing. She sounds a little like Tori Amos. If you have a chance to go hear one of her shows, I’d recommend it. I know I’m going to try to go listen again sometime! Big thanks to Terri for asking me to DJ, and to the staff at Rio Learn Gardens for letting me entertain for a bit! It was a great time, and I hope you all enjoy your Second Life!! So the other night Brody and I were hanging out and I get this IM from Sophia. Sophia Harlow: OOOOO brody has a magic wand? Alicia Chenaux: yes, he does. Sophia Harlow: starax’ magic wand? If you have no idea what I’m talking about, here’s a tiny history lesson, yanked from what I’ve found on Google. Back in the day, Light Waves [yes, of Rezzable fame] was Starax Statosky. And Starax created a magic wand. The wand responds to I believe 150 words and when you say a word, a creation comes out! There aren’t many people with the wand today, it’s no longer sold, and it’s not transferable. 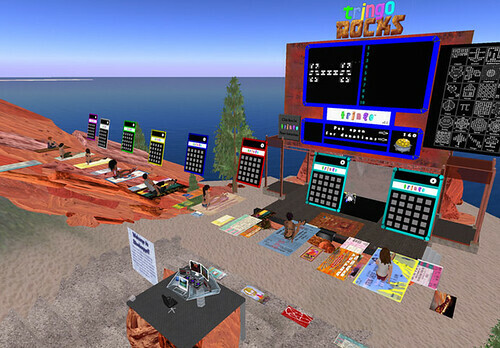 So it is a TRUE collector’s item, and one that a lot of people in Second Life have never seen in action. So when I told Brody that Sophia learned he had a wand, he said that she should come over and get a demonstration of the wand. It’s so much fun to play with, and he never minds showing it off. I TPed her over and we got to playing. Nothing is sculpted in the wand, it’s all prim work, and it is FANTASTIC. There’s so much! My favorite favorite favorite thing in the wand is when you call for the Gallows. Gallows pop up, you select Farewell, and suddenly you’re in a long dark tunnel and you have to go towards the light. The light ends you up in Heaven!! Well….Heaven’s waiting room, anyway. LOL! We sat around, but I guess the angels were just too busy to come get us. Or they saw us coming. I’m not sure which. I love that wand. Of course, Sophia and I are about 12 years old at times and we couldn’t help talking about how we shared his wand, played with his wand, and the wand was so big, she almost fell off. LMAO! I love that girl.